Slash has debuted the music video for “Mind Your Manners,” a track off his latest solo album with Myles Kennedy & the Conspirators, “Living the Dream.” What’s extra unique about the clip is that it was put together with the help of an army of Slash fans. Last month, Slash and his band — Myles Kennedy on vocals, Todd Kerns on bass, Brent Fitz on drums and Frank Sidoris on rhythm guitar — asked fans to help with the filming of a live music video at the band’s tour stop at the Palladium in Hollywood, California. Thousands of fans came out to the show and shot live footage of the concert with the Cinebody app, and then director and editor Clifton Collins spliced the footage together to create the final music video. Watch the full video via YouTube below. 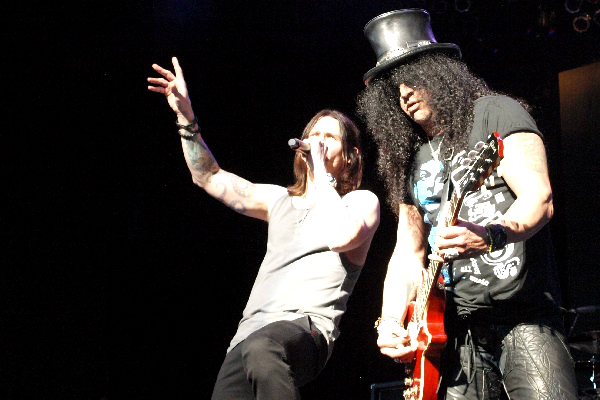 Slash and his band recently closed out a U.S. tour in support of “Living the Dream.” They’re looking ahead at a busy 2019, as Slash and Myles Kennedy and the Conspirators are scheduled to start a tour of Asia in January. Slash is also keeping busy with Guns N’ Roses dates, as the guitarist is currently performing on the 10th leg of Guns N’ Roses Not In This Lifetime Tour, doing dates in Asia through the end of November.